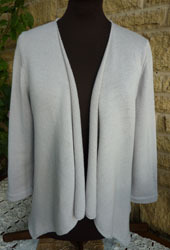 Hello everyone and a warm welcome to my machine knitting design website. My name is Clair Crowston and this website is intended for anyone, young or not so young, who has an interest in machine knitting and knitwear. 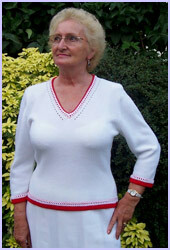 Here is a photo of me modelling one of my designs (#38). I am available for lessons (private tuition), demonstrations and full day workshops. Click on images to go to appropriate Patterns page. I mostly use a Brother 950i electronic machine to create my knitwear designs but occasionally use a Knitmaster 700 machine too. Included in all my knitting patterns are punchcards for both Brother and Knitmaster machines where necessary. 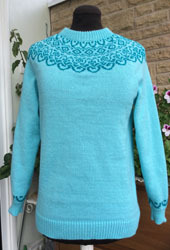 Machine knitting has been a part of my life for over 40 years and I am totally self-taught. 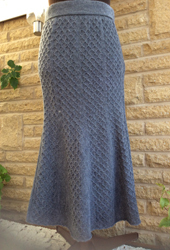 Creating designs and writing patterns, so that other people can knit them, is very important to me. Domestic knitting machines use the weft knitting method which produces a fabric similar to hand knitting. Knitting proceeds more quickly than in hand knitting, where (usually two) straight needles are held in the hand and each stitch is manipulated individually across the row. Knitting machines work an entire row of loops in a single movement. The fabric produced using a knitting machine is of a more even texture than hand-knitted fabric, which is particularly noticeable on large areas of plain stocking stitch. This is an advantage, and saves a considerable amount of time. Many people prefer the look of hand knitting and skilled hand knitters can produce quite even fabric, while machine knitters can produce a good fabric as the machine tension does the job for them. Some stitch patterns (e.g., tuck stitches) are much easier to produce with a knitting machine.